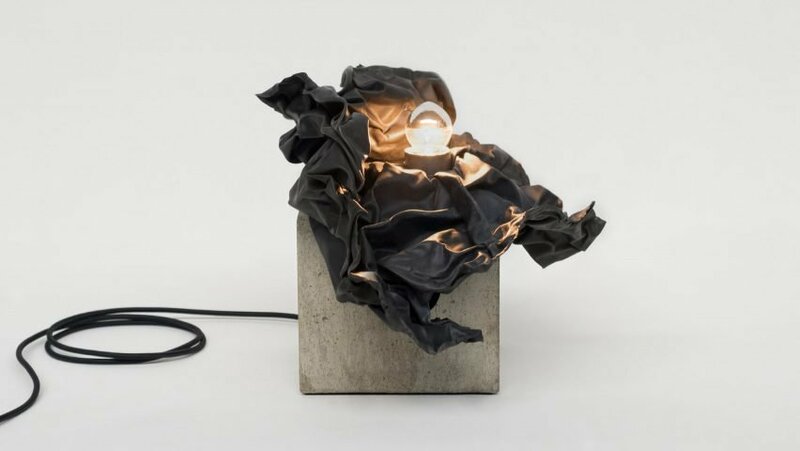 No two works are the same in JamesPlumb’s new lighting collection, which features crumpled sheets of lead that sit on top of cubed concrete bases. The London-based studio designed the series of handmade lamps as part of their Studies in Permanence collection, which they devised as a rejection of the “conventional perfection” that comes with mass-produced objects. “We are drawn to objects that cannot be replicated, and to the idea that total permanence cannot be,” the duo told Dezeen. The shadows cast from the bulb is intended to emphasize the differences in two materials – the complex forms emitted from the lead is set against the simple block of shadow from the concrete. JamesPlumb’s Studies in Permanence collection reflects the artistic background of both the designers, who studied fine art sculpture at the Wimbledon School of Art. The collection also includes a sculptural bench, which was showcased by Gallery FUMI and was one of Dezeen’s top picks from the PAD design fair in London earlier this month.